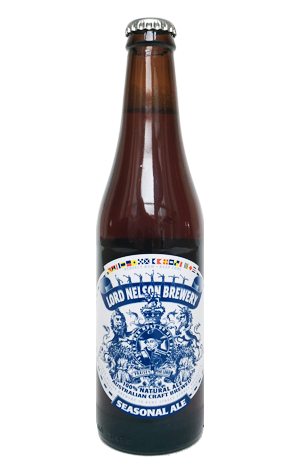 Now into a fourth decade brewing at its iconic home in The Rocks, the Lord Nelson is sticking to its roots for the latest seasonal release to appear in bottles. No haze, no bacteria, no barrels to be seen here, just another interpretation of the sort of English style ales that inspired Blair Hayden to start the operation in the mid-1980s. For winter 2017, they've pulled 111 from the recipe book and had a larger batch of it brewed and bottled off site to send around the country. It's dedicated to the late Ron Gross, a founding partner of The Lord, and named in honour of Horatio Nelson whose extensive battle scars, they claim, resulted in him "sporting only one eye, one arm and as is oft quipped, one..."
As for what's in the bottle, it's their take on an English style IPA so, while there's a fair amount of hops involved, they're not of the sort to conjure a fruit salad or punch a hole in your palate; instead the English Goldings and Target are of the earthy, twiggy variety and are found tucked in alongside nutty, toasted caramel malts and a touch of fruitiness from the yeast. It's chestnut hued, with a full, cream-coloured head and is the sort of beer that deserves to be drunk a little warmer than is usual for beers in Australia, out of an old school pint glass, with a copy of the Racing Post in one hand and a Ploughman's platter on the table in front of you. Flat cap and whippet optional.